With over 600,000 units sold to date the Hide Em In Your Heart series has become one of the most trusted childrens music brands in the Christian marketplace. Hide Em was created in 1990 by Frank and Betsy Hernandez to communicate strong biblical content to children by using popular music to teach Bible memory verses. 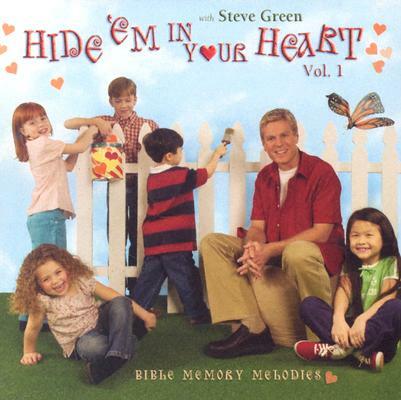 In the words of Hide Em narrator and vocalist Steve Green nothing surpasses the treasure of hiding Gods word in our hearts. For more than ten years Green has sung these timeless Bible memory melodies in his live performances, introducing them to new groups of children. The target audience for this product is parents, specifically mothers, who are teaching their children the value of scripture memory. In celebration of this brands continued success Hide Em In Your Heart Volumes 1 & 2 will be re-packaged to appeal to a new and diverse generation of parents and children. Hide Em In Your Heart 1 by Green Steve was published by EMI in July 2003 and is our 49734th best seller. The ISBN for Hide Em In Your Heart 1 is 0724358236323. Be the first to review Hide Em In Your Heart 1! Got a question? No problem! Just click here to ask us about Hide Em In Your Heart 1.